Maxine Waters has absolutely lost her marbles. We’re talking like a gaping hole at the bottom of a bag that is blowing in a gentle breeze. She is now giving out dangerously useless advice that reduces minorities and black people specifically to nothing more than their skin color, which is something we’ve been trying to avoid doing since the abolition of slavery. At least I thought so, until this moonbat opened her pie-hole. 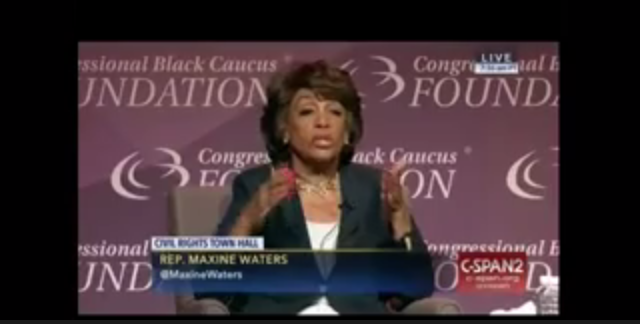 In a town hall about civil rights held by the Congressional Black Caucus, Waters encouraged members of groups like Black Lives Matter and black people in general to “get controversial” and run for office. And then she told them to do something that will never, ever help their cause. She told them to use the race card. There was a time in America where African Americans wanted to be judged by the content of their character and not the color of their skin. Why are we letting these people take us back in time to a period that is taught as a cautionary tale? The race card does nothing for you as a group, as a person or as a cause. It only shows that you are unable to argue your policies as a matter of logic and fact, and resort to meaningless things like skin color as a way to “win” an argument. Waters, you should be ashamed of yourself for encouraging people you’re supposed to be empowering to rely on their skin color to take them places in the world. I thought we were beyond that as a country, but now I can see that you want to bring it back as long as it benefits you. You’re despicable.